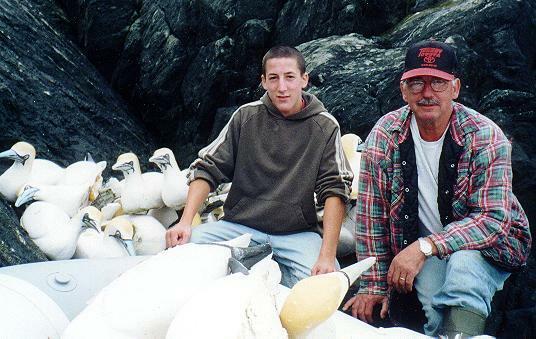 2000 was year #7 for the Gannet Rock Recolonization Project. 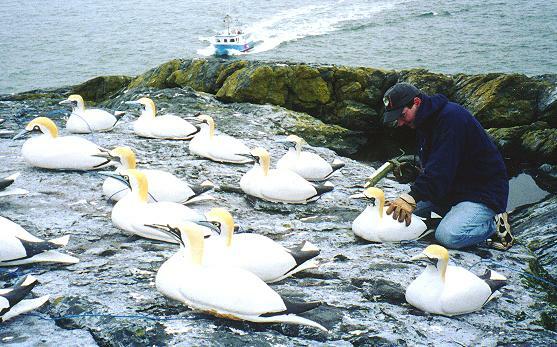 51 Gannet decoys were placed on Gannet Rock on April 21 along with the Canadian Wildlife Service (CWS) sound system. The sound system was removed on August 18; the decoys, on September 23. 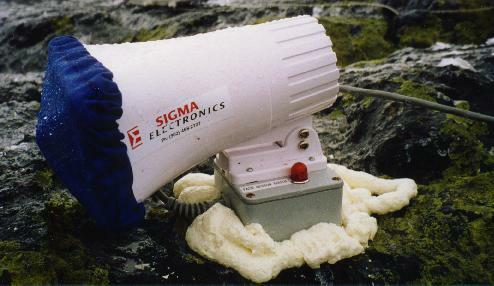 The sound system would squawk out Gannet colony sounds during daylight hours and shut off at night. I would go to the Rock every couple of weeks to change the battery running the system. This also gave me a good excuse to go to Gannet Rock to see what was going on. 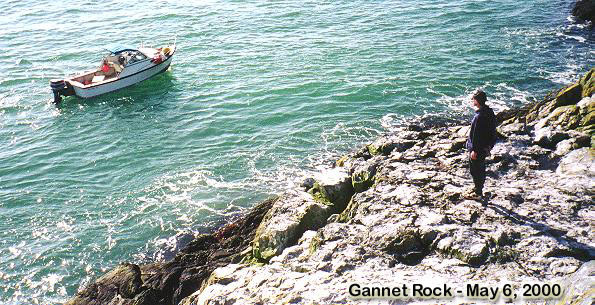 Needless to say, I don't need much of an excuse to go out to Gannet Rock or anywhere else in my boat, as it is always an exciting adventure. Again this year, no Gannets have nested on Gannet Rock. Fewer Gannets were seen in Lobster Bay and around Gannet Rock in 2000 than were during the previous summer. No Gannets were observed with the decoys though there was some pecking damage to the decoys done by either gulls or Gannets. The sound system failed several times and there may be a problem with one of the speakers. I will have to check it out over the winter. Hopefully, next year will show more promise of success than the year 2000. Perhaps more like the 1999 season when from July 12 to August 17, on four consecutive visits, one mature Gannet was observed on the Rock resting and preening with the decoys. It had allowed me to photograph and videotape it at a relatively close range with little apparent intrusion on its privacy. This exciting work on Gannet Rock has all been made possible with the assistance of the many friends and volunteers helping me in all the varied aspects of the project. I thank them all. We will see what the year 2001 will bring to Gannet Rock. I am still optimistic. The following is a chronological listing of my 2000 work with the Gannets of the Lobster Bay and the Gannet Rock area of southwest Nova Scotia, Canada. The report also includes Gannet observations from other local residents. 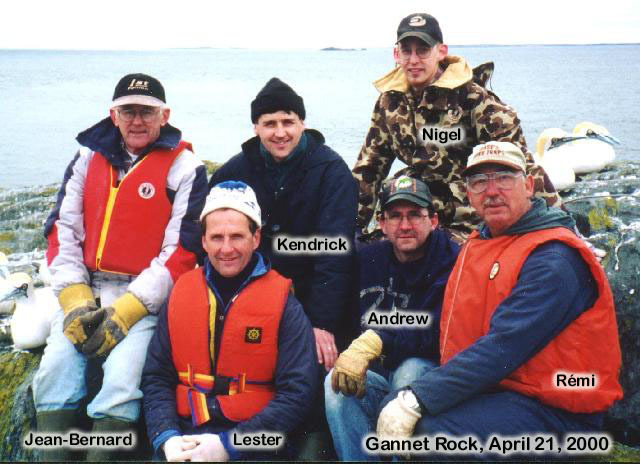 April 21, 2000 - 51 decoys were glued and tied to the rock. The sound system, on loan from Canadian Wildlife Service (CWS), is operational also. 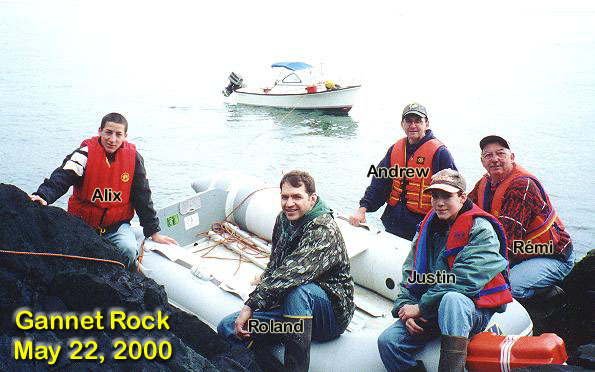 Crew: Andrew and his brother, Lester D'Eon, Jean-Bernard, Rémi, and Kendrick d'Entremont, and my son Nigel. We saw 33 migrating Gannets while we were on or near Gannet Rock. Other bird sightings at Gannet Rock: 1 Palm Warbler, 2 Great Cormorants, 1 Glaucous Gull, 1 Iceland Gull, 3 Ravens, about 25 Black Guillemots and a few dozen Herring and Great black-backed Gulls. No Gannets were seen on this trip though the lobster fishermen, fishing in the area, were still seeing them. 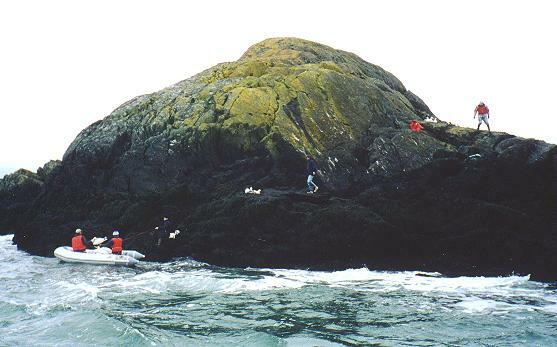 May 22, 2000 - To Gannet Rock and Green Rock. Crew: Andrew, Rémi, Alix, Justin d'Entremont, and my brother, Roland. The sound system was still on and the battery was changed. The decoys sustained some pecking damage. Four or 5 gull nests were found on Gannet Rock; one of them was a Herring Gull's, the others, Great Black-backed's. About 20 Atctic Terns were above the rock and one Arctic Tern's nest with one egg was found. No Black Guillemots nests were found though there were dozens of birds around the rock. One Puffin was seen nearby. On Green Rock (a.k.a. Green I.) we saw another 25 or more Puffins, estimated approx. 100 Common Eider nests and twice as many gull nests, mostly Great Black-backed Gull's. 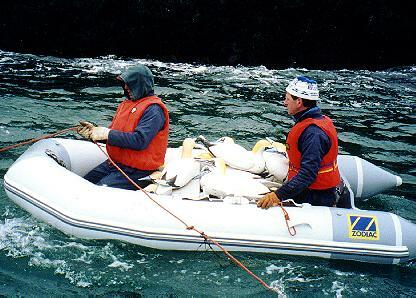 June 4, 2000 - To Gannet Rock again for a battery change. My crew: Andrew, Rémi, Eddie and Léry d'entremont, Alix with his mom, Nora, and his uncle, Leroy d'Entremont. The sound system was off; there were no Gannets on the Rock, however, two possible Gannets were seen in the distance. There were about 20 Arctic Terns in the air above Gannet Rock,and 7 Arctic Tern nests were found. Five contained 2 eggs each; two nests contained 1 egg each. Three or 4 Black Guillemot nests were also found on the Rock. A young Grey Seal was seen on the rock with a yellow plastic tag attached to its right rear flipper (at least thought to be its RIGHT rear flipper). On its back was branded or marked by some other method, "34D". I will try to find out when and where it was tagged. 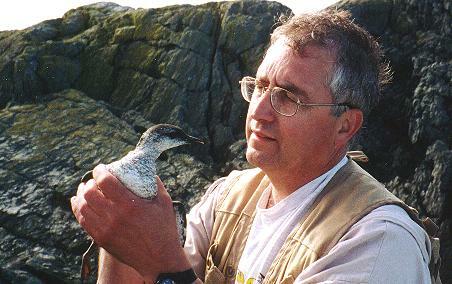 June 21, 2000 - To Gannet Rock again for a battery change. 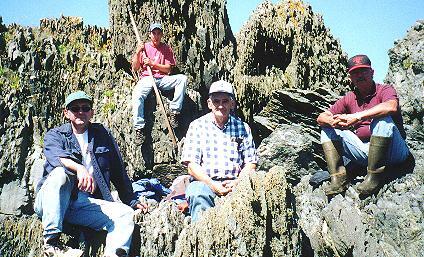 My crew: Rémi, Jean-Bernard, Alix with his uncle, Ronny d'Entremont, and my brother, Roland. The sound system was off; there were no Gannets on the Rock; 17 Gannets were seen in the area. Six Arctic Tern nests were found. Only two of the nests had warm eggs. There were about 25 Arctic Terns in the air above the Rock. There were also a few Black Guillemot nests found. 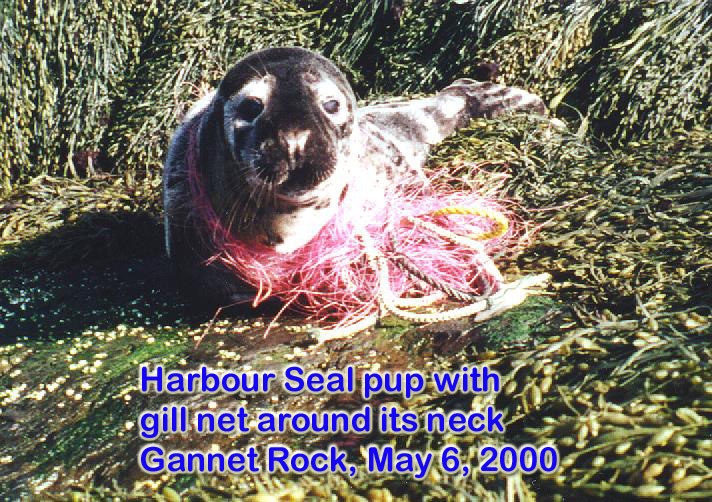 Another tagged Grey Seal was seen on Gannet Rock; this one with the characters "090" in red paint on its back and a possible red or orange tag affixed to one of its rear flippers. 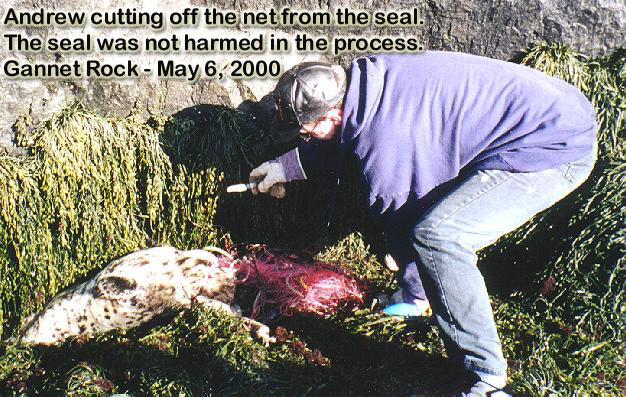 I have since spoke to Dr. W. Don Bowen, seal specialist of the Department of Fisheries and Oceans (DFO), about the tagges seals. 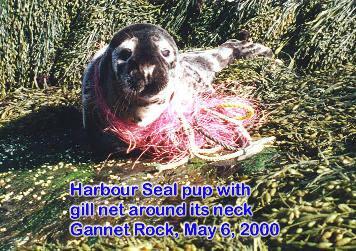 He told me the seals were Grey Seals and they had been tagged as pups on Sable Island in January 2000. An unusual sighting was about 100 shearwaters (mostly Sooty) on our way to Gannet Rock from Spectacle I. 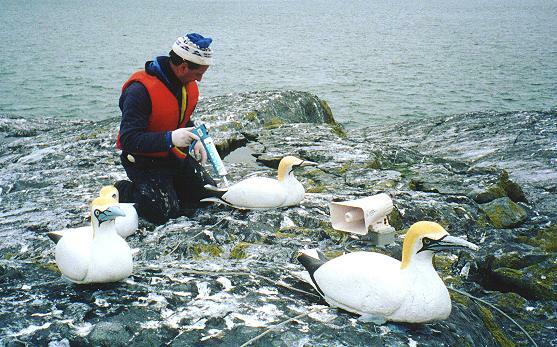 Three damaged Gannet decoys were removed from Gannet Rock. We then went to Green Rock where we counted 40 Puffins and one Black-billed Cuckoo. Eventhough we estimated 100 Common Eider nests on out last visit to Green Rock, no eider ducklings were seen. 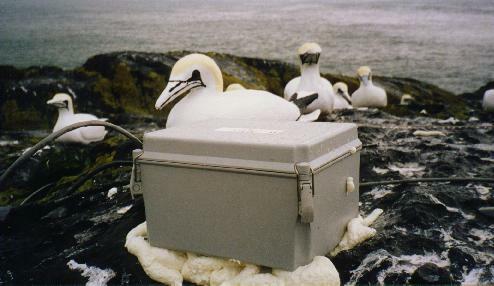 July 1, 2000 - Returned to Gannet Rock for a battery change. The sound system was again non-operational. I questionned whether the switch was working, yet when I placed the battery on its charger, it was pretty well discharged. We saw about 5 Gannets flying as we approached Gannet Rock, and about a dozen Sooty Shearwaters. On the Rock itself were 12 Black Guillemot nests, only one of which contained nestlings. More interesting was a Black Duck on the top of Gannet Rock with a brood of 8 ducklings only a few days old. The ducklings huddled together in a crevice after the adult flew away. We could not figure out where it nested but it had to be somewhere on the top of the rock. The weather was gray and there was a swell. My crew: Andrew and Lester D'Eon with Rémi and Alix d'Entremont. July 30, 2000 - To Gannet Rock again for another battery change. We only saw 5 Ganneta in the area. A couple of Black Guillemots chicks were almost ready to leave the nest; another chick was deep in a crevice. One young seal with the characters "33R" branded or painted in red on its back was seen at Gannet Rock. My crew: Andrew, Roland and Ingrid D'Eon, Alix and Roderick d'Entremont. 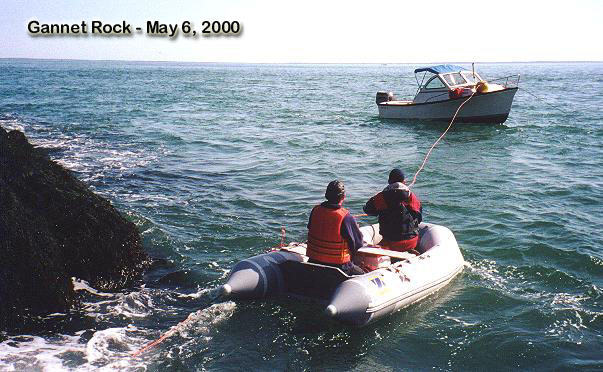 August 19, 2000 - We removed the battery and sound system from Gannet Rock. We then motored on to Green Rock where we saw only 5 Puffins. No Gannets at all were seen on this trip. My crew on this trip: Andrew, Rémi, Alix, and Alderic d'Entremont. 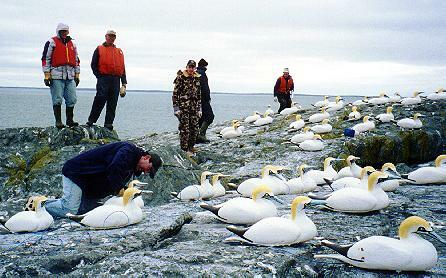 September 23, 2000 - Removal of Gannet decoys from Gannet Rock. One Gannet flew overhead while we were at the rock. Also of note was a Peregrine Falcon sitting on a ledge of the rock as we arrived. We saw it a few more times flying around. A Northern Waterthrush was also seen there. My crew were Rémi and Alix d'Entremont.